This Celtic wire charm bracelet is expandable, the one size fits most women's wrists. This Book of Kells wire bracelet is gold plated and is enhanced with green enamel accenting. 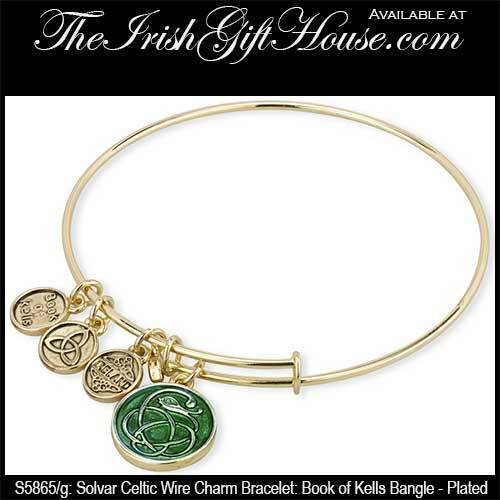 The Book of Kells Celtic expandable wire bangle is a one size fits most design. 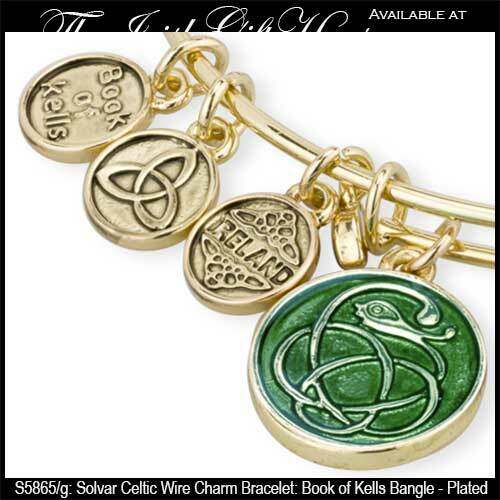 This Irish charm bracelet is gift boxed with a Celtic knot history card and is crafted under license by Solvar Jewelry in Dublin, Ireland. The Book of Kells name and logo featured on this piece of Irish jewelry are registered trademarks of Trinity College, Dublin. The Book of Kells Celtic knot charm measures 5/8” diameter. The Trinity knot, Book of Kells and Ireland charms are 3/8” diameter. The Ireland charm features Celtic Trinity tnots.